A taste of dark chocolate and toasted almonds combine with savoury undertones and robust tannins resulting in a wine that can be enjoyed for years to come. 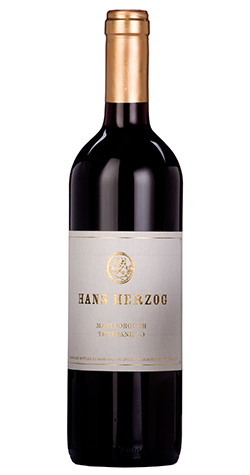 Aromas of ripe red and dark berries intermingle with smoky vanilla and clove. On the palate confit plums, dark chocolate and toasted almonds combine with savoury undertones and robust tannins resulting in a wine that can be enjoyed for years to come. On a long, warm Autumnal day, we picked our Tempranillo grapes at an extremely low yield of 450g/vine. This is Spain’s most famous red grape variety, widely planted in the Rioja and Ribera del Duero. Tempranillo can be enjoyed young, but the best ones are aged for several years in oak barrels. This Tempranillo spent 21 days on the skins progressing to a wild yeast fermentation before being pressed and transferred into French oak barriques for malolactic fermentation. This great “Spaniard” has been aged on its fine lees for 18 months. No fining and no filtration to maintain its beautiful aromas and flavours.